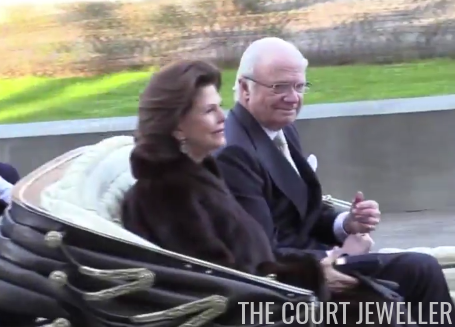 Queen Silvia wore the earrings from the family's Leuchtenberg Sapphire Parure, a suite of antique sapphire and diamond jewelry that is often worn for special occasions. Crown Princess Victoria, on the other hand, went for extremely modern jewels. At the same time, though, the necklace also resembles ancient jewelry found Egypt. Here's a better look at her entire outfit, which also includes a modern gold bracelet and embellished shoes. Princess Madeleine wore a pair of silver-toned earrings; her shoes also had pearl-esque embellishements on the ankle strap. There were other royal women in attendance, including the king's sisters, Katherine of Serbia, Countess Marianne Bernadotte, and Princess Takamado. You can see glimpses of some of their arrivals above; there are also a few photos available on Jenny Alexandersson's blog at Aftonbladet.